Between September 16 and September 18 I attended the Sixth Balkan Light Conference in Athens, Greece, organized by the National Technical University of Athens, the Hellenic Ministry of Culture, Education, and Religious Affairs, and the Hellenic Lighting Association. Balkan Light is an event happening every three years, proposing the state of the art of research and best practice in the use of lighting in all of the Balkan region. The conference has a focus on this specific geographic area, but also sees the participation of experts from other countries. In this edition for example I met people from Germany, Italy, Thailand, Barbados. I was invited by the organizing committee in the context of a session dedicated to light pollution. 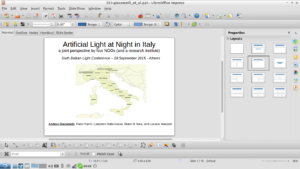 For this I proposed a talk with a joint overview by four non-governmental organizations and one research institute on artificial light at night in Italy. The presentation was co-authored with Luciano Massetti from the CNR Biometeorology Institute (with whom I collaborate in the Loss of the Night Network), Mario di Sora from the Italian Stargazer Association (UAI), Fabio Falchi from Cielobuio, and Leopoldo Dalla Gassa from Veneto Stellato. These are not all the stakeholders that I have been interacting in Italy on night sky quality issues, and in the presentations I made a point of reminding this. Simply, they represent those with whom in over seven years we were able, from the BuioMetria Partecipativa project, to build some form of collaboration. I also made a call to others, both nationally and internationally, to make contact with us and understand if/how we can relate for ongoing and future initiatives. The conference was for me also a great opportunity to learn more about lighting technologies applied to anything: from interior design, to ancient monuments or caves, and recreation, reinforcing my current understanding of many issues related to artificial light, not just at night. Last but not least: I had yet another confirmation that Italy, for reasons I am still investigating, has something (positive) that other countries do not. It appears that in ancient Greece, folks were building lamps for indoor lighting. However, the really elegant models of lamps were imported from Italy. Not that I needed to come to Balkan Light to learn that Italian design is really cool, but it’s interesting to see how a fact finds additional evidence in contexts where you wouldn’t expect it! The next Balkan Light conference will be in Bulgaria in 2018. It would be nice to be there with some of the folks I met in Athens, presenting the accomplishments we will have obtained from the seeds we planted in Greece. Que sera, sera! 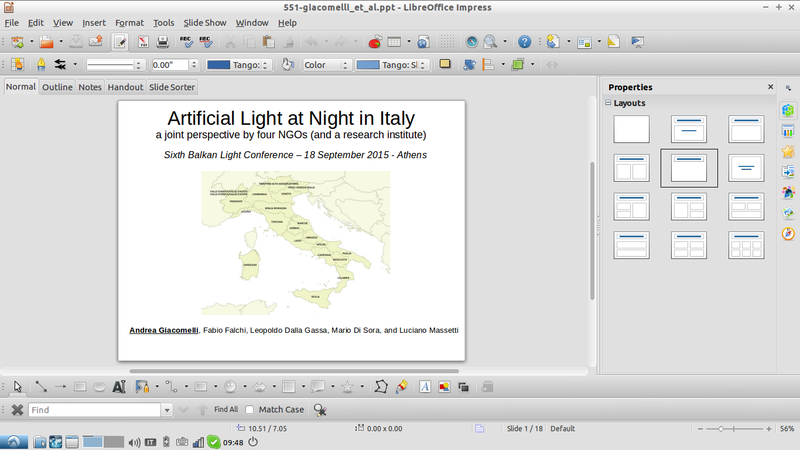 Also, with Attivarti.org I am co-organizing together with SAIT Toscana a one-day symposium on light in October 29, Leghorn, at the Natural History Museum in Leghorn, The event will host presentations by Luciano Massetti and Federico Giussani.